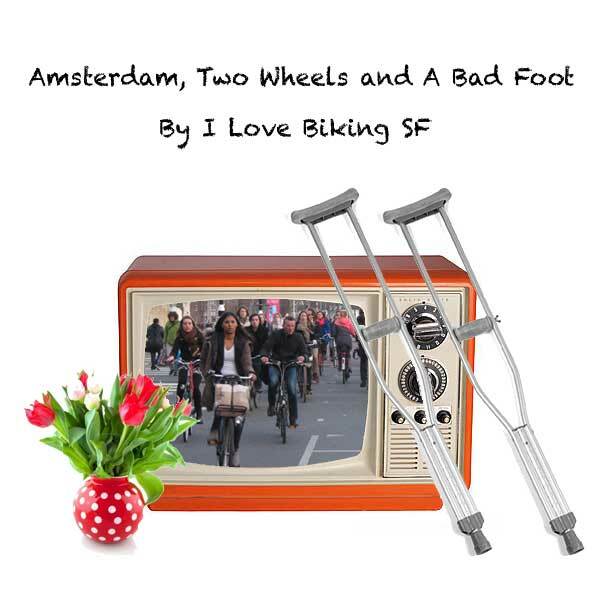 In a previous post, we were going full steam ahead with our plans to travel to the bicycling capital of the world, Amsterdam, even though Nellie had injured her foot and was unable to bike or walk very much. We were encouraged by videos that we had seen by Bicycle Dutch about how the bike infrastructure in the Netherlands also benefits disabled people by making it easier for them to get around and by the fact that we could rent a bike with a wheelchair attached to the front. Amsterdam is the world leader in bicycle infrastructure- they have more bikes than people at about 1.5 bikes per person and the percentage of trips made by bicycle is between 50-60%. We were interested in experiencing and seeing this city of bikes for ourselves, with two wheels (the wheelchair bike actually had three) and a bad foot. We arrived at Schiphol airport in Amsterdam in the early morning hours on a Thursday, and we were able to directly board a train to Amsterdam Central station which is located in the heart of Amsterdam. We were able to take the airport’s complimentary wheelchair all the way down to the train platform. Taking a train is a lot cheaper than taking a taxi. The train into Amsterdam Central only costs 4 euros per person as opposed to 35-40 euros for a cab. 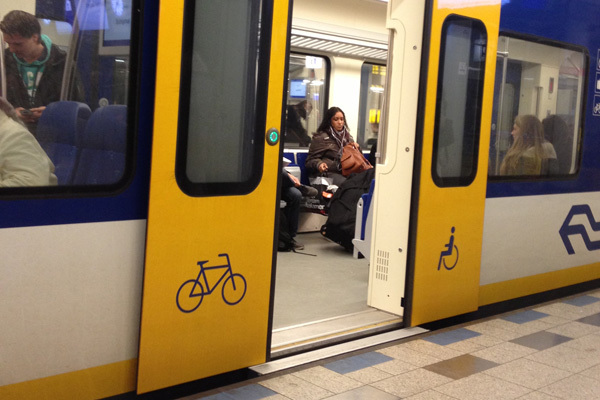 Trains are wheelchair and bicycle accessible. The photo below shows this unbelievably huge bike parking station that we saw right outside of Amsterdam Central station. 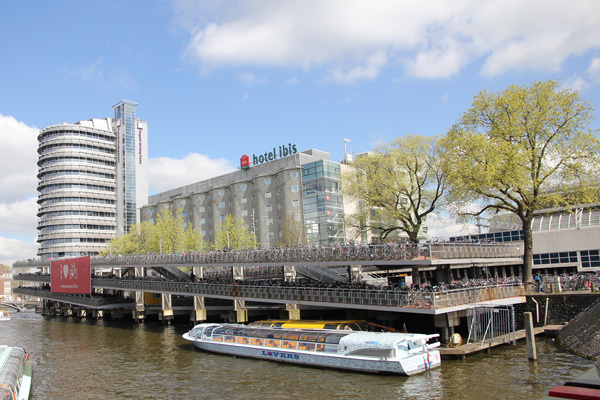 It is probably Amsterdam’s most famous bike parking station as it is featured in a lot of photos and media online. Even though it was as big as a small multi-level car parking garage, it still didn’t have enough room to hold all those bicycles. Thousands of parked bikes were lined against bridge railings, on sidewalks and in other parking stations nearby. The locals are probably used to it but as an outsider, being there was surreal and we even saw other visitors taking their own photos and videos of it. Bike parking station near Amsterdam Central. The first thing we had to do when we arrived at Amsterdam Central was pick up a wheelchair bike. We had one reserved two weeks in advance at StarBikes Rental. However, when we arrived at Amsterdam Central, things didn’t go to our expectations. The train station was larger than we had imagined and it was really difficult for Nellie to walk the distance to exit the station. It would have helped if the train station loaned out wheelchairs but I didn’t think about it at the time. Nellie had her orthopedic walking boot on so she was able to make it outside the station with some effort. She sat at an outdoor table near a Subway sandwich shop while I immediately went to StarBikes Rental to get the wheelchair bike, a good 10 minutes walk from the station. We had to hurry because we had an appointment to meet the apartment manager where we were staying to get the room key. The wheelchair bike was $32 USD (25 euros) for a 24 hours rental and it came with a heavy blanket to keep the wheelchair rider’s legs and body warm. It had three speeds which is plenty enough for Netherlands’ flat topography and backpedals to brake. Then I realized that it was next to impossible to haul two luggages (both attached to each other) and pedal Nellie on the wheelchair bike to our apartment. I had to make two trips, first walking with the luggage to the apartment to meet the manager, drop off the luggage, go through orientation, and get the room key. Then back to pick up Nellie and pedal her to the apartment. Luckily, it was not very far from the station but it was a huge time-wasting ordeal and Nellie had to wait outside the train station with the wheelchair bike in the cold for me for over an hour. If you plan on traveling to Amsterdam with people with limited mobility, I recommend hiring a cab to get to your hotel first to unload your luggage instead of trying to do what we did, especially if you are unfamiliar with the area. Then once settled, go to pick up the wheelchair bike if you want to use one. Also, if you plan on staying in an apartment instead of a hotel, make sure it has an elevator or consider staying in a hotel instead. Most of the apartments in Amsterdam are in old houses which do not have elevators. Our apartment didn’t have one but had three flights of stairs Nellie had to climb up. After we settled into our apartment, Nellie was able to rest her foot since it got very swollen. We rested until we were ready to venture out again, plus the jet lag was kicking in hard and we fell asleep. It was an overcast Friday morning when we headed out on the wheelchair bike for the first time. 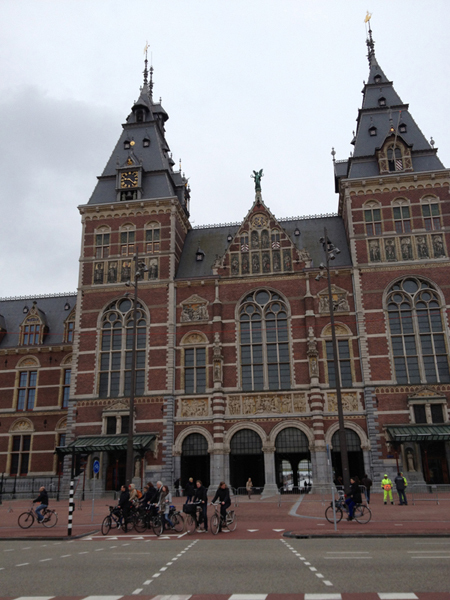 We headed across town to the Rijksmuseum, a famous museum in Amsterdam. We approached the backside of the museum and when we got there we saw that the bike passageway under the museum to get to the other side was barricaded off to cyclists. The guards turned away a woman trying to ride through so instead of going straight, we went around the block to reach the other side. When we got there, we noticed a group of people on bikes were somehow able to ride through the Rijksmuseum passageway and they passed right in front of us. They seemed pretty happy and excited and some of them were cheering. We had no idea what was going on and were confused but thought nothing further of it. It is hard to see in this photo, but the Rijksmuseum bike passageway through the arches was blocked by barricades. 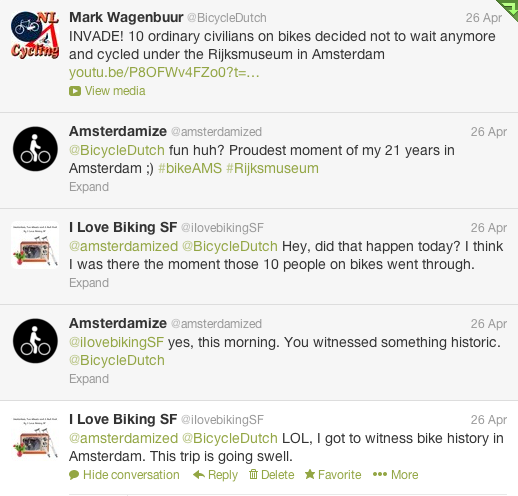 Later by chance, we found out what took place that morning via the tweets of @BicycleDutch and @Amsterdamized. At first, I didn’t make the connection between what I saw that morning with the discussion on Twitter, but then when I watched the video that @BicycleDutch linked, it all clicked for me. Thanks to @Amsterdamized, I later found out more of the background story of what happened that morning and why: The long-existing bicycle passageway under the Rijksmuseum had been closed for a good 10 years for the rennovation of the museum. However, having bikes go through there did not fit the vision of the museum director who used his powers to try to permanently close the bike path. Thankfully in the end, there was a vote and the director lost. The re-opening of the bike path was then stalled to May 14th because according to the director, there would be mayhem and that they need time to prepare precautions. That morning, a few cyclists in Amsterdam were tired of waiting for it to re-open and decided to partake in some good old civil disobedience. On the other side of the museum- I happened to take a photo either just before or after the group of protestors rode through. I think this guy was at the way front or end of the pack. What I learned from that act of civil disobedience by a bunch of ordinary civilians is that despite Amsterdam being the bike capital of the world and long having bicycles be a part of their history and culture, they still have to advocate for biking and bike infrastructure there. I naively assumed beforehand, that unlike here in San Francisco, almost everyone was on the same page about biking there, and that just about any bike project would get off the ground with hardly a peep against it. The fact that the Rijksmuseum director would try to stop this bike path from re-opening despite it being there since 100 years ago was unthinkable to me. I realize now that advocating for bicycle infrastructure and cyclist’s rights is something that will never end no matter where a city is in the world or where they sit on the Copenhagenize Index. 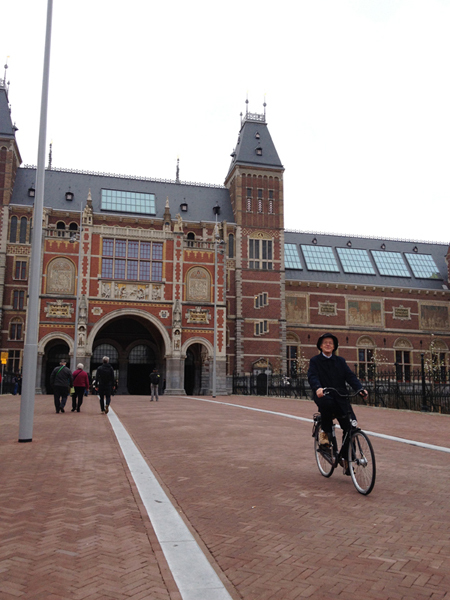 Update on the Rijksmuseum bike passage: It’s now open! Congrats Amsterdam! Read more about it at the links below! Video: First ride through – Fietstunnel weer open! Stay tuned for the next post in the series, Two Wheels and A Bad Foot in Amsterdam where we share in more detail, our experience biking in Amsterdam’s busy city center in the days leading up to Queen’s Day, a huge national holiday in Netherlands. We’ll also show you the wheelchair bike modeled by Nellie herself.